Live Chat with HRL on our NEW website! We are pleased to announce the launch of our new, mobile-friendly, responsive website! You’ll find that information is better organized, easier to find, and much more plain and simple to navigate. Our website features an overview of department information which will be supplemented by blog posts from this blog for further, date-specific information. But we’re even more excited that our website provides us another way to connect with YOU! We’ve added a chat feature to our website that is staffed during business hours (9am-5pm) by a real life HRL professional! While we still enjoy your emails, you’ll find our chat will get you real-time information when you’re looking for it. To find our chat, just look for the “Let’s talk” box at the bottom right hand corner of your screen – yup it’s even there on this blog page! 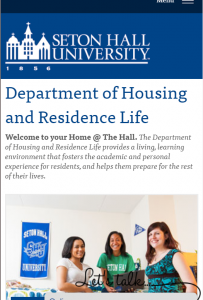 If it says online, there’s a HRL professional there waiting to talk to you! If it’s after hours and it says offline, you can leave us a message and we’ll get back to you when we’re back in the office. 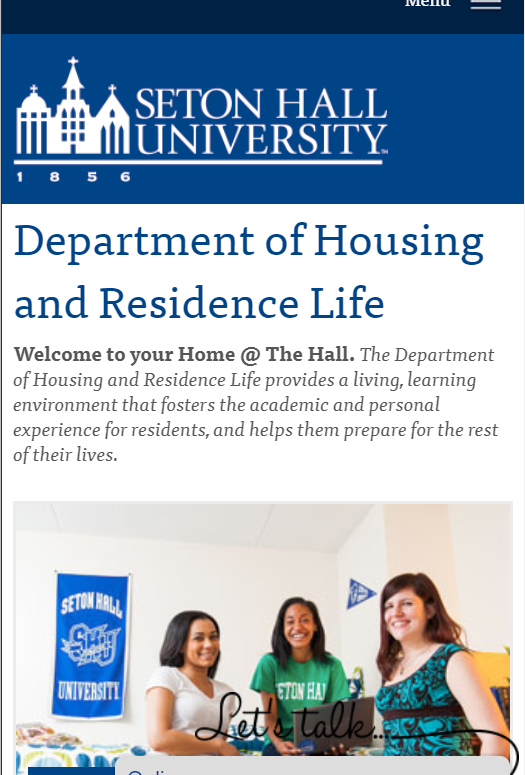 We’re so excited to chat with you that we will give the 1st, 10th, 20th, and 56th person to chat with us through the website their very own Seton Hall t-shirt! Author Cheryl McCloskeyPosted on September 19, 2017 September 19, 2017 Categories Processes, TechnologyTags Chat, communication, department, information, Parents, professional, questions, websiteLeave a comment on Live Chat with HRL on our NEW website!